Keypoint Intelligence - Buyers Lab, the world’s leading independent evaluator of document imaging software, hardware, and services, today announced the winners of the first-ever BLI PaceSetter awards for Smart Workplace Vision. "Although print is becoming a smaller piece of the office technology puzzle, office equipment vendors are well-positioned to be the vanguard that brings next-generation technology to the workplace." 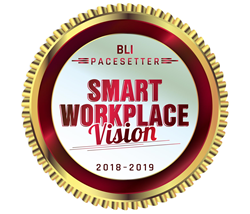 Keypoint Intelligence - Buyers Lab, the world’s leading independent evaluator of document imaging software, hardware, and services, today announced the winners of the first-ever BLI PaceSetter awards for Smart Workplace Vision. These awards, based on research conducted for the Americas and the EMEA market, recognize the document imaging vendors that offers the most impressive vision for the Smart Workplace of the Future along with the portfolios of hardware, services, and solutions to support and execute that vision. To determine which document imaging vendors are shaping that future, analysts at Keypoint Intelligence conducted a first-of-its-kind study that examined leading vendors’ approaches to the Smart Workplace. Key areas of evaluation included the companies’ visions for the future workplace, current (and planned) products and services to move customers toward that vision, current and future channel and go-to-market strategies, ability to execute their visions, and more. Main points that helped Konica Minolta stand above the other vendors in the study included the company’s forward-looking vision of the future of work and a clear roadmap of how to get customers there, plus its willingness to invest in innovative technology outside the core document imaging space. Konica Minolta has a strong portfolio of Smart Workplace offerings, including the ALICE automated receptionist kiosk, meeting room software and services, and the Workplace Hub hybrid IT-infrastructure appliance. In the Americas, Konica Minolta garnered points in the analysis thanks to its All Covered IT services division, which has the proven expertise to implement and manage these varied technologies. The EMEA division benefitted due to its investment in IT services as well. Both companies garnered points thanks to Konica Minolta Business Innovation Centers around the world, which drive transformation of Konica Minolta’s core business technologies by expanding into new areas of software and services and improving and innovating business processes for customers.